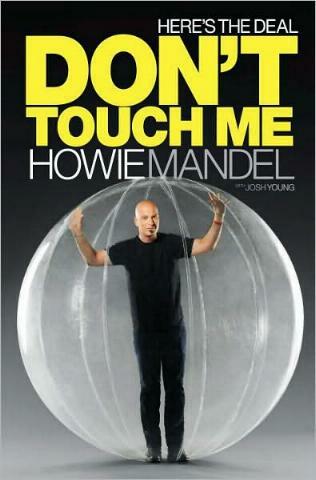 I didn't know much about Howie Mandel until more recently when Deal or No Deal arrived on the scene (St. Elsewhere back in the day I should add) and he was more visible, both on television and in print. I did know about his germaphobia but not about his OCD or ADHD. In this personal and revealing look at a man who lives his professional life in the glare of the public, Mandel opens up to the "mental issues" he lives with on a daily basis, how he recognized his "problems", and what he does to overcome them and have a life. Many people will rejoice reading his book, for he is not alone in his debilitating daily life, and will find comfort knowing that you can get on with their lives. Not easy, but then nothing really worthwhile is easy. I think many of us have a little OCD in us and can kind of identify. Kind of. Mandel grew up in Toronto, Canada, and right from the get-go was an attention junkie. He writes with love and humor as he recalls his past and fills in the blanks for us. I loved Chapter 3, A Sense of Humor. In it Mandel describes his own wacky sense of humor, what a sense of humor is, and what he got up to in the name of humor. Hilarious. Sad, but hilarious. Some of the things he got up to are incredible (poor, poor Lou) and will have you either writhing with laughter or cringing at the cruelty. Naturally he talks about his career, from start until now, with humor and openness. It's funny how life happens when you least expect it, and Howie Mandel is more like everyone else (with OCD and ADHD) than you think. Even though his thoughts race, his fears and insecurities are much like the norm. Okay not "the norm" per se, but you get it. His love story about his wife of over 30 years is touching. And, there's no mention of him being a drug addict or an alcoholic. Yay! Thankfully Howie's heart problem was looked into, treated, and is now under control. Good health to you! Conclusion - Most entertaining and a great insight into what some people have to deal with living with OCD and/or ADHD.